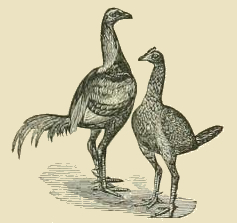 Drawing depicting what the author described as the perfect game fowl. I won’t go into all of the specific characteristics that the author seemed to feel made the perfect chicken. Images of this nature may not even represent an actual bird but rather an artist’s rendering of what the author has created. Either way, this chicken image is in the public domain and can be used however you wish. This pair of long-legged chickens are just waiting to walk away with your heart.